All it took was one basket-making workshop to hook James Carthel. Now, several hundred baskets later, 75 of those pieces are on display in the Club Room at Rose Villa Senior Living Center, where Carthel is a resident. The baskets represent 15 different weaving techniques that Carthel has learned by attending workshops all over the United States. The exhibit is open to the public from 8 a.m.-7 p.m. Monday through Saturday and from 9 a.m.-5 p.m. Sunday, through March 30. Carthel retired in 1990 after 33 years teaching choral music and school administration in Texas. He retired for good in 2000, after short careers as a retirement community administrator and as a customer service trainer for clerks in the district courts of Harris County, Texas. Raised on a farm in that state, Carthel chose to take a master gardener class as a retirement pastime. The subject of basket making came up, and that led Carthel to take a class from members of the Clear Lake Basket Weavers Guild in Texas. That one class led to a host of others and dozens of baskets made from a variety of materials that include cedar, willow, honeysuckle vines and grass cord. At the workshops, "the teachers come with materials all prepared. Then I go home and look around my yard and see what fibers I can find," Carthel said. One versatile plant he discovered was kenaf, an African plant that shares some properties with hemp and jute. He also has made baskets from the leaves of yucca plants that he found in his yard and from plastic newspaper bags. In 2011, Carthel and his wife, Carol, started coming to Portland to visit their son and his family. The couple eventually moved to the metro area and realized they had to downsize. When they left Texas in 2015, they got rid of many of their belongings, including about 200 of Carthel's baskets. Settled into Rose Villa in Oak Grove, Carthel found it harbored a thriving artistic community. "Rose Villa as an entity is so committed to the arts and values artistic endeavors," he said. The staff uses "the arts to keep us alive." In 2018, Carthel was asked to exhibit some of his baskets, but he didn't think he had enough remaining work. However, he eventually found about 75 baskets of varying shapes, sizes and fibers to display in the Club Room. Looking for basketry materials in his environment plays into several of Carthel's interests. "I am passionate about sustainability," he said, adding that his garden plot at Rose Villa is gold certified by the Audubon Society and Columbia Land Trust. Carthel also is a member of Rose Villa's Green Team, promoting the use of native plants in the landscaping at the center. Several baskets in the display were made using fibers from materials Carthel collected on the grounds at Rose Villa, including one made from tall grass and another made from rope that landscapers put up around construction zones. Two of the baskets make use of the Nantucket style of basket weaving that Carthel learned from a class taught by John McGuire, co-author of "Basketry: The Nantucket Tradition: History Techniques Projects." Crewmen aboard the Nantucket Lightships made many of the baskets and "being a basket weaver in the 19th century was a big industry," Carthel said. But with the coming of the Industrial Revolution, those skills were no longer practiced. McGuire wrote books and taught workshops to preserve the techniques, Carthel said. Nantucket baskets begin with a slotted wooden base for wood spokes to go into and then thin slats are woven through the spokes. These baskets also have covers and handles. Also on display is a cowboy hat Carthel made from harvested cedar. "It took 16 hours to make the hat," he said. When he discovered he had a number of tiny baskets, Carthel put together a mobile, which visitors can look at from several different angles. Carthel said he is grateful to all the teachers he has encountered in workshops over the years and the support he has received from members of guilds, both here and in Texas. When he started visiting Portland, he joined the Columbia River Basketry Guild and highly recommends their workshops to anyone wanting to learn the art of basketry. 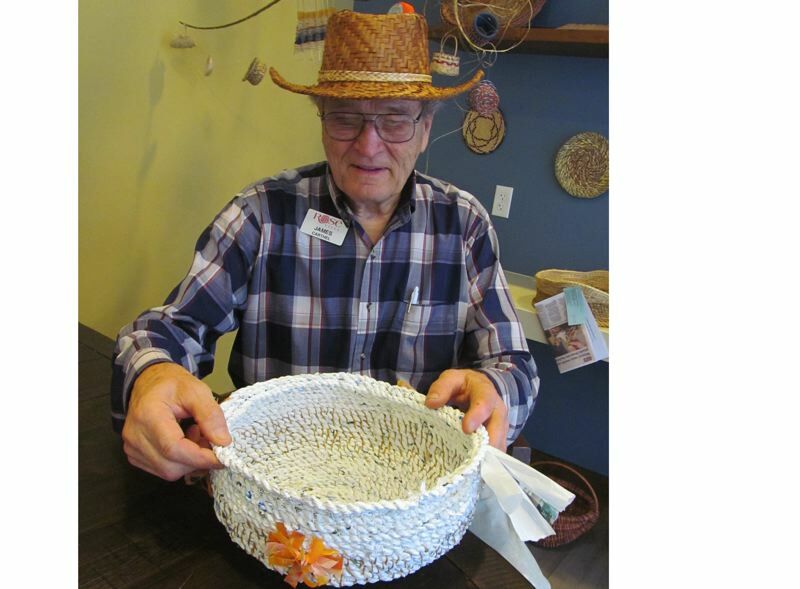 Carthel plans to continue to make baskets because, he said, "I love working with my hands, and it keeps my brain moving." The Club Room also has a display of photography by Rose Villa residents, including: Theresa Carney, Stephen Weislogel, Nancy Rorden, Betty Hosokawa, Bob Weisman, Patrick Mizelle, Sue Griffin. Ricky Jamtgaard, Bob Lease, Mo Weathers, Ruth Ross, Ed Eggling and Susan O'Dell.